In popular tradition witches were either practitioners of magic or people who were objectionable in some way, but for early European courts witches were heretics and worshippers of the Devil. This study concentrates on the period between 1300 and 1500 when ideas about witchcraft were being formed and witch-hunting was gathering momentum. It is concerned with distinguishing between the popular and learned ideas of witchcraft. The author has developed his own methodology for distinguishing popular from learned concepts, which provides adequate substantiation for the acceptance of some documents and the rejection of others. This distinction is followed by an analysis of the contents of folk tradition regarding witchcraft, the most basic feature of which is its emphasis on sorcery, including bodily harm, love magic, and weather magic, rather than diabolism. The author then shows how and why learned traditions became superimposed on popular notions – how people taken to court for sorcery were eventually convicted on the further charge of devil worship. 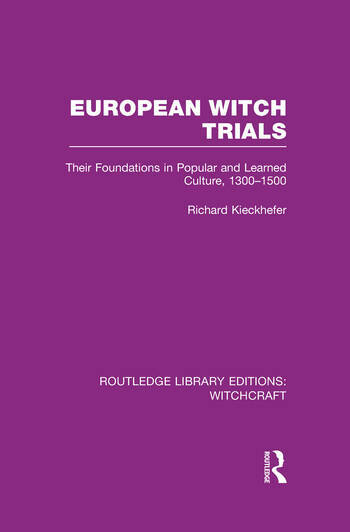 The book ends with a description of the social context of witch accusations and witch trials. Preface 1. Introduction 2. Chronological Survey 3. Distinction of Popular and Learned Traditions 4. The Content of Popular Tradition 5. The Imposition of Learned Notions 6. The Social Context of Witch Trials 7. Conclusion. Calendar of Witch Trials. List of Abbreviated Titles. Notes. Addenda. Index.